The RIPE NCC is one of many volunteer operators participating in the AS112 project, which helps reduce the load on IANA blackhole servers in answering DNS queries for addresses reserved for private use. The AS112 project provides a distributed sink for queries sent to non-unique IP address (such as private addresses defined in RFC 1918) in order to reduce the load on the in-addr.arpa authoritative servers in answering such queries. The AS112 project is named after the Autonomous System Number (ASN) that was assigned to it. This is defined in RFC 6304, "AS112 Nameserver Operations". 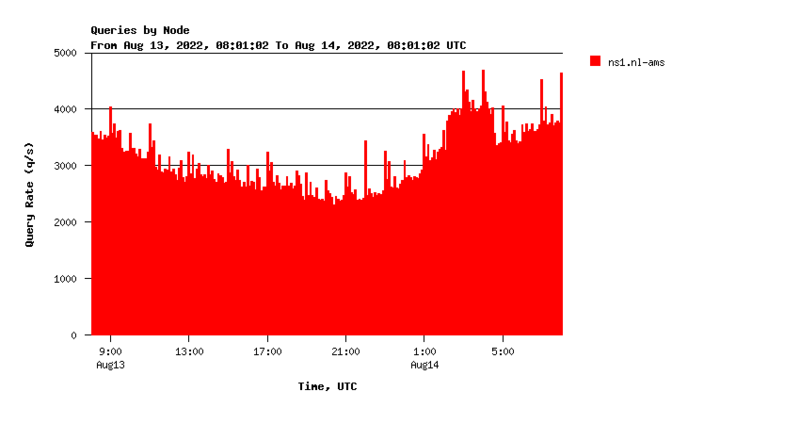 This graph displays the queries received at ns1.nl-ams.as112.ripe.net per second during the day. All statistics are subject to a four-hour delay before being published. See all statistics on a daily, weekly, monthly, yearly basis. Click on the graphs to get more statistics.